The 2015 pride parade and festival focused around the idea of family in all forms, shapes, sizes, and colors. The pride parade began at 11 a.m. and the festival began at 12 p.m. on Oct. 17. Students from Salem College, Wake Forest University, and University of North Carolina School of the Arts walked in the parade. Many Salem students walked in the parade with Salem’s Open Up. Open Up is a club on campus that works to educate the community on LGBTQIA+ issues, advocate for LGBTQIA+ people and issues, and provide a safe space for those in the LGBTQIA+ community. 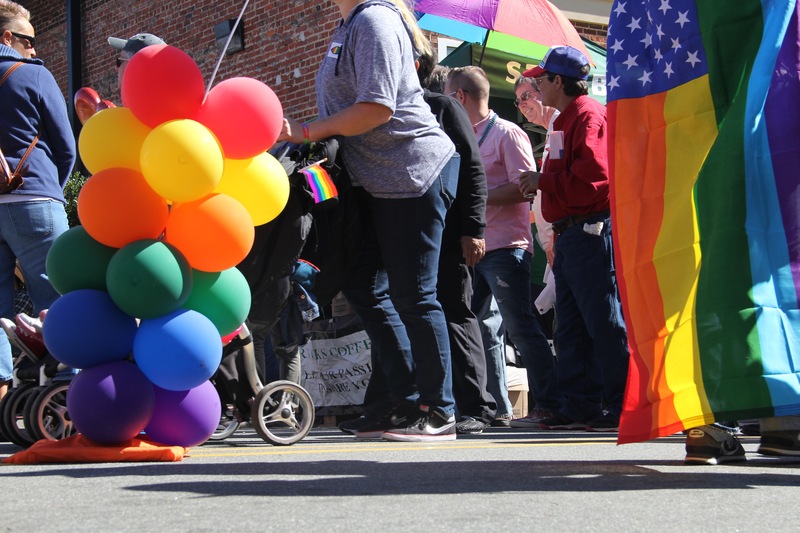 The club, headed this year by seniors Brooke Medina and Jasmine Suryawan, walks in the winston-salem pride parade each year to show support for LGBTQIA+ students at Salem. There were some protesters at the event who were located at the center of the event but the protest was peaceful overall. For the event, the art district closed the streets off to cars and lined the streets with tents that were bursting with color. Both sides of Trade Street had stages set up with different entertainment scheduled throughout the day. Some of the tents were advertising a certain organization that advocated for LGBTQIA+ rights or showed that their business or organization supports the LGBTQIA+ community. Other tents were selling rainbow-striped gear so all people could show off their pride or support for the LGBTQIA+ community. Food trucks were also at the event, selling everything from Thai food to classic barbecue, and desserts from soft serve to cupcakes. Overall, the pride parade and festival was a huge success with attendance estimated at 10,000 to 12,000, according to Fox 8 News. Members and supporters of the LGBTQIA+ community were warmly welcomed and despite some minor mishaps, the event ran smoothly. Many Salem siblings were bursting with pride at this year’s pride parade and festival.